Images are an important part of blogs but they also make website heavy and affect the loading time. If you use images that are big in size, it increased the website load time and makes website heavy. Since site performance and speed is an important factor in Google’s ranking, we must take care of this. So optimizing images will be helpful for website’s SEO. Too many large images also increase the bandwidth usage and also consume more space. So not just for SEO, image optimization is also good for reducing server cost.This is the reason I am writing a descriptive guide on how to optimize WordPress images with losing Quality. 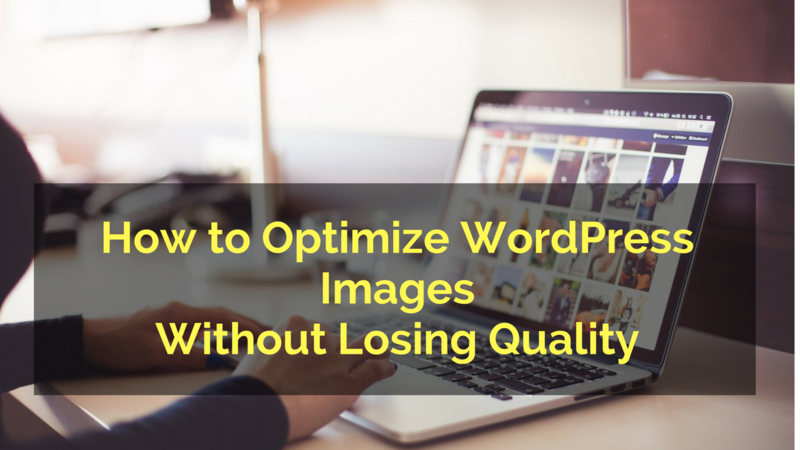 Here are few ways to optimize WordPress images without losing quality. You need to follow every steps for better results. There are various different image file formats including JPEG, GIF, and PNG. Here, JPEG images should be your first choice. This format contains many colors and also uses compression in order to reduce the file size. It uses lossless compression techniques so retain the high quality but reduce the image size. So, try to use this file size for the images you upload. If you are using self-hosted WordPress, use of image optimization plugins is the best way. These plugins not just optimize the existing uploads but also optimize the new images you will upload in future. I already wrote about best Image Optimize plugins for WordPress. So, you can read that post to select a good WordPress optimization plugin for your blog. Few paid plugins are also available that work good. If you can afford, you should try. Paid plugins offer better optimization. This is the best way of image optimization. If you are already uploading an optimized image, you will not have to worry about the image size. Dedicated image optimization tools offer better optimization that the WordPress plugins for image optimization. These are few online and offline tools. With these tools, you can not just optimize the image size but also control the image dimensions. There is no need to use the image having more than 3000 pixels width unless you are not creating a blog dedicated on photography. So, take care of image dimensions as well. By reducing the image dimension, you can automatically reduce the image size. Images are an important part of the blog, but image optimization is an important need. By optimizing your images, you will reduce the website’s page load time, reduce the bandwidth, get SEO boost and improve the user experience. While optimizing image before uploading on the blog, always check for the image quality. If you reduce the image size too much, it will affect the image quality. In case you have the blog dedicated to photography, you must use lazy load for images. It will help you in using the large size images without affecting the load time. If you have anything to ask, do not forget to leave the comment.